Like many moviegoers, I was somewhat excited for World War Z, the Brad Pitt-fronted adaptation of the bestselling zombie survival guide written by Max Brooks. Despite the behind-the-scenes budget drama and reshoots that plagued the film, I got a kick out of the trailer when it premiered earlier this year. Despite the inundation of zombie apocalypses in pop culture (The Walking Dead, 28 Days Later, Warm Bodies, the Resident Evil franchise), I knew I'd eventually cough up several bucks to see -- once again -- the entire planet get torn apart and ravaged by flesh-eating nasties. However, even though I had never read the book, I knew the movie had gone through drastic changes to transform it into a summer blockbuster with mass appeal -- and this is where I (partially) have my biggest beef with it. Gone were the first-person accounts from the book that gave the global disaster different perspectives from around the world. 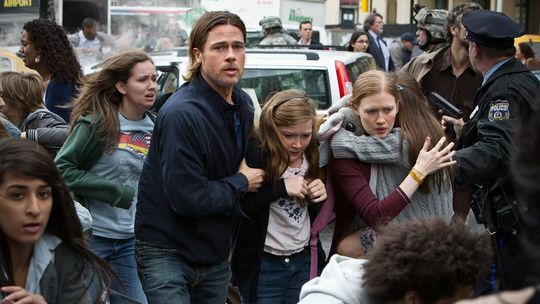 Instead of a large, disaster-movie-like ensemble, the movie version of World War Z focuses on a family man (Pitt) who flies around the world to find a way to clean up this undead mess (it definitely helps that he's a former U.N. officer who's capable of getting access to wherever the hell he wants). WWZ is just one of many examples in which the protagonist is a loving father and husband who must race against time to save those who matter most to him. Why do action heroes need families? 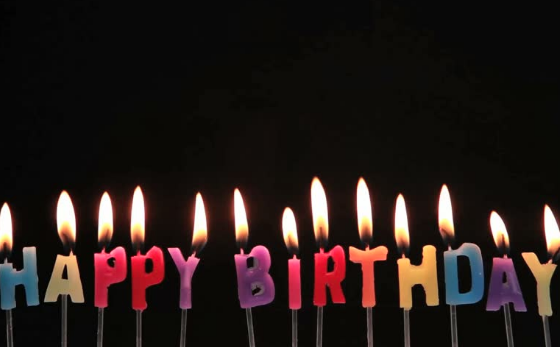 It's a simple Hollywood rule: it makes them more relatable or likable. And, for the most part, it guarantees a safer, PG-13 rating. This isn't the only movie that has used the "family man" approach to tell a protagonist's story. In Roland Emmerich's 2012, hero John Cusack had to race against time to save his brood from being swallowed up by the Earth. Last time I checked, Charlton Heston didn't have a kid with Ava Gardner in 1974's Earthquake, and Sean Connery only had Natalie Wood to hold on to in 1979's Meteor (Hi, I'm an aficionado of disaster flicks). 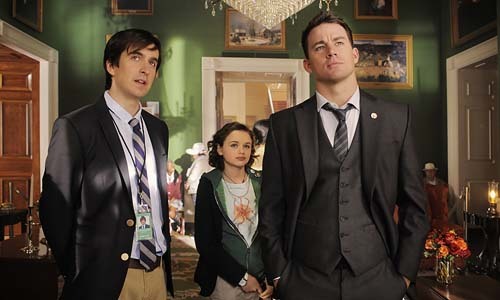 And look at this week's White House Down (also directed by Emmerich): Channing Tatum, who shares the same birth year as me, is given an 11-year-old daughter in the film...to eventually rescue, natch. Why? Because, according to Hollywood Blockbuster Arithmetic, it raises the stakes and gives his character a more relatable edge: What would YOU do to save YOUR child from terrorists? Of course, this child/spouse-in-danger scenario is nothing new. 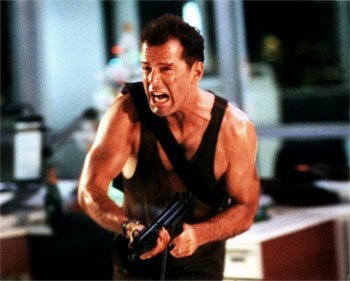 It goes way back to the original Die Hard (and farther back, I'm sure), but it's popping up more often, creating a trend in the genre that is starting to, I believe, tell audiences that a character isn't well-rounded enough or worthy of a compelling story if he or she a) isn't married b) isn't divorced or c) is childless. In fact, the inclusion of young children in peril nowadays, to me, is feeling forced and bordering on being straight-up manipulative and exploitative, especially when a piece of Styrofoam has more parental charisma than said action star. Sure, John McClane had kids, but did we see them in that 1988 blockbuster? He only had ex-wife Holly trapped at the top of Nakatomi Plaza. His kids didn't really come into play until earlier this year when the fifth installment, A Good Day To Die Hard, featured his adult son as a sidekick and his grown daughter as first- and third-act filler. The last two decades in the genre speak for itself: Taken, The Last Kiss Goodnight, and True Lies -- daughters in peril. Snitch and Ransom -- sons in peril. The Day After Tomorrow -- son and son's girlfriend in peril. The Happening -- a group of schoolchildren in peril (as laughable of a movie as that was). And then there's this fall's Prisoners in which Hugh Jackman and Jake Gyllenhaal search for two kidnapped little girls. I'm sure there are tons of other examples; I'm just too lazy to do the research right now. And don't even get me started on the horror genre. The Ring, Insidious, Sinister, Dark Skies, The Conjuring, Silent Hill, and Paranormal Activity 2 and 3 are all guilty of placing parents and their offspring at the forefront of some traumatizing business. My question, then, is this: Why can't we see more single, unattached guys (or gals) save the day in an action blockbuster? Are action heroes better -- and therefore, that more sellable -- if they're playing the role of Loving Parent while diffusing a bomb in ten seconds or less? Or is this just a case of lazy screenwriting? Should we single folk with no kids try to be less sensitive, stuff our mouths with popcorn, sit back, and just watch the damn movie? Or can an alternative action hero exist -- and thrive -- in a marketplace and industry that requires them to check off a list of traits that makes them widely appealing? Can't they be driven and motivated by something other than a helpless little girl in pigtails clutching a stuffed animal while hanging from a precipitous ledge?